Hezbollah updates toll to eight dead from clash with Nusra Front terrorists - who claim Hezbollah actually attacked them. Hezbollah sources on Monday updated their earlier figures, reporting that eight of their terrorists had been killed in nighttime fighting with Al Qaeda-linked Nusra Front terrorists on Lebanon's eastern border with Syria. The Lebanese The Daily Star quoted security sources saying 20 other Hezbollah terrorists were wounded in the clashes outside the village of Brital, located south of the city of Baalbek. On the Nusra Front side, 14 were killed and five captured according to the Lebanese security sources. Hezbollah said the fighting broke out on two of its posts, Ain al-Saha and Al Mihfara, just outside of Brital. A Hezbollah source told the Lebanese paper that Nusra Front had briefly taken over one of the posts, but that Hezbollah managed to grab the site back. "All the fighting is taking place inside Syrian territories as militants are seeking to gain a foothold in Qalamoun, where their presence is weak," the source said. "They have been launching intermittent attacks." The mountainous Qalamoun region is a strategic area, widely used by Syrian rebels to transfer arms and goods into Syria where they can be used against Syrian President Bashar Assad's forces, which Hezbollah has been backing. For its part, the Nusra Front claimed it was attacked by Hezbollah, with a Twitter account associated with the group saying Monday morning they had repelled Hezbollah outside of Nahleh, a village northeast of Baalbek. 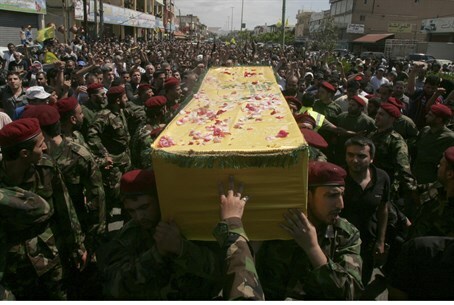 The Tweet claimed that dozens of Hezbollah terrorists were killed and wounded in the fighting. Nusra Front and other Syrian rebel forces early last month took control of the Syrian Golan Heights, and along with Islamic State (ISIS) started conquering parts of Lebanon, temporarily gaining control of the city of Arsal. The instability on Israel's doorstep has many concerned in the Jewish state, particularly after a brief gun battle broke out on Sunday afternoon as the IDF opened fire on an infiltrator from Lebanon, who apparently was trying to conduct a terror attack. One Lebanese soldier was reportedly wounded in the clash.